The Newly Appeared Saint of the island of Rhodes, in Greece, and Miracle-Worker, is commemorated by the Church on August 27. 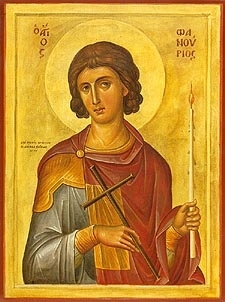 There is no literature available in the Church prior to discovering his little church in Rhodes so not much is known about Saint Phanourios's life other than the image of his martyrdom on his icon. The only literary evidence that supports a historical date, relating to this Saint, is documented in the book Lives of the Saints, which testify that the icon in Rhodes was discovered around 1500 AD. Some sources support the opinion that the icon was discovered in Cyprus and not in Rhodes. A 2008 research paper suggests that there are two manuscripts. The first is the mention of a miracle included in the Cod, Vat. Gr. 1190 (dating from 1452 and written in Crete) and was published in the Acta Sanctorum. The second manuscript originates from Heraklion, Crete, dating from 1600-1640 (Vassilakes-Mavrakakes 1980-81, p. 226). Both of these manuscripts describe a miracle that took place in the island of Rhodes which caused the Saint's fame to spread from Rhodes to Crete. The Saint was depicted upon the holy icon as follows: He was shown as a young man, arrayed as a soldier, holding a cross in his right hand, and at the upper part of the cross there was a lighted taper. Round about the perimeter of the holy icon were twelve scenes from the only one's martyrdom, which showed the Saint being examined before the Magistrate; then in the midst of a multitude of soldiers, who were beating him about the mouth and head with stones; then stretched out upon the ground while the soldiers flogged him; then, stripped naked while they rent his flesh with iron hooks; then incarcerated in a dungeon, and again standing before the tyrant's tribunal; then being burned with candles; then bound to a rack; then cast amidst wild beasts; then crushed with a great rock; then standing before idols holding burning coals in his hands, whilst a demon nearby wept and lamented; and finally he is shown standing erect in the midst of a fiery furnace, his hands, as were, uplifted towards Heaven. From the twelve scenes depicted upon the holy icon, the holy hierarch perceived that the Saint was a martyr. Then straightway that good and pious man sent deputation's to the rulers of that place, asking that they consign to him that temple for restoration; but this they declined to do. Therefore, the hierarch traveled to Constantinople alone and there obtained a decree empowering him to rebuild the church; thus it was restored to that state in which it can be seen even to this day, outside the city. And it has become the source of many miracles, of which we will relate one for the profit of many that all who love and venerate Saint Phanourios may rejoice. At that time the isle of Crete had no Orthodox hierarch, but a Latin bishop, for it was ruled by the Venetians, who had shrewdly refused to permit an Orthodox hierarch (bishop) to be consecrated whenever one died. This they did with evil intent, thinking that with time they could thus convert the Orthodox Christians to the papist dogmas. If Orthodox men wished to obtain ordination, they had to go to Cythera. It came to pass that there went forth from Crete three deacons, traveling to Cythera to be ordained priests by the hierarch there; and when this had been accomplished, and they were returning to their own country, the Hagarenes captured them at sea and brought them to Rhodes, where they sold as slaves to other Hagarenes. They newly consecrated priests lamented their misfortune day and night. Then the Great Martyr Phanourios went to them that night and brought them forth from their bonds, and encouraged them, saying that the following day he would, by all means, free them. He then appeared to the Hagarenes and, reproaching them with severity, said: "If by tomorrow ye have not set y our servants at liberty, ye shall behold the power of God!" Thus saying, the holy one vanished. And, O, the wonder! As many as inhabited those houses all arose blind and paralyzed, tormented with the most dreadful pangs, the least with the greatest. But the Saint appeared again to the Hagarenes on the third night and said to them: "If ye do not send to my house letters of manumission for the priests, ye shall have neither the health, nor the light [of sight] which ye desire." And when they had again conferred with their kinfolk and friends, each one composed a letter of emancipation for his own slave, which were left before the holy icon of the Saint. And, O, the wonder! It's a pious Orthodox Christian tradition that if you lost something, try baking Phanouropita (cake for St. Phanourios). Saint Phanourios, the patron Saint of lost articles, helps people find anything from a missing piece of jewelry to good health and happiness. When asking Saint Phanourios for help, a cake is baked for the forgiveness of his mother, a troubled woman. The cake is brought to the church and placed to be blessed by the parish priest. Afterwards the holy blessed bread or cake, Phanouropita, is shared by those attending the Divine Liturgy. A heavenly song of praise is brightly sung on the earth; the hosts of the Angels keep an earthly festival now in splendor and radiant joy; from on high, they praise with hymns thy suffering and struggles; and below, the Church doth laud the heavenly glory thou foundest by thy contests and pains, O glorious Phanourios.